Clip-on ties are the safest neckties on the market. When wearing one, you can never be choked, grabbed, or dragged by your tie. Sounds gruesome, right? But it is a reality for factory workers who could get their ties caught in machinery and law enforcement and security officers who may have face to face encounters. 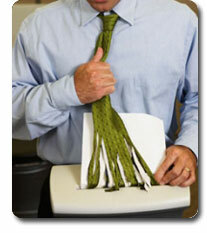 You have enough worries while on the job, your necktie should not be one of them!